Our self select Bach Flower Remedy sets are an ideal starter or gift set. You can choose any 10 different Bach Flower Remedies for your set, which will come in an attractive card presentation box. Each remedy is at Stock Level and is handmade for you with love and care and preserved in organic brandy, helping to ensure that we provide you with the best possible quality of remedy. 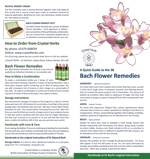 Bach Flower Remedies are wonderful, simple and easy to use remedies that can help you to achieve a greater balance and harmony in life.